← Windows 10 Privacy Issues – Fact or Fiction? Stop your bitching and stalling; just take the software upgrade already; Hands on: What’s new and noteworthy with Android N; Get fit for summer with these workout apps; Smartphone Owners Move to Block Ads; Why the MySpace hack matters to you, a non-MySpace user; Periscope introduces real-time comment moderation; Cops can easily get months of location data, appeals court rules – and much more news you need to know. Microsoft’s Outlook and Hotmail spam filters are currently broken – If you’re noticing an increased amount of spam email in your Outlook or Hotmail account this morning, you’re not alone. Microsoft’s spam filters for its Outlook.com email service have been experiencing issues over the past 12 hours, and the company is attempting to fix the problems. “Some users may be receiving excessive spam mail,” reads a warning on Microsoft’s Outlook.com service status site. Microsoft says it is currently implementing two fixes to solve the issue. Stop your bitching and stalling; just take the software upgrade already – I get it. You don’t want your software updated or upgraded. You believe your system is static, that if it works now, it will continue to work the same as it does always. You don’t want to change, because that would mean acquiring new skills, or doing something differently. Or worse — the possibility of having to spend money. You’ll be damned if that awful, evil vendor makes you spend more of your hard-earned cash. If it isn’t broke don’t fix it. Because if this approach “works” for the federal government, it’s got to work perfectly well for you, right? Well, until it doesn’t. Hands on: What’s new and noteworthy with Android N – With Google’s I/O developers’ conference behind us, it’s time to start looking forward to what’s next in the world of Android. The most prominent thing is Google’s rapidly approaching Android release, currently known only as Android “N.” (The company has yet to reveal the full name or version number.) While the software itself isn’t expected to arrive until sometime this summer, we’re getting an increasingly clear picture of the fresh features and improvements it’ll provide. 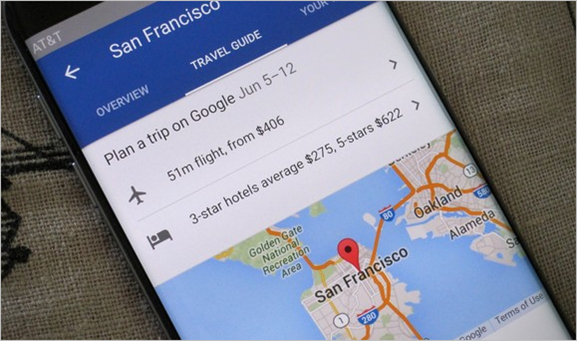 Plan your summer vacation with Google’s suite of travel tools – Google has gotten serious about helping you find flights, hotels, and keeping track of all the details. Google Maps gains better discovery features in Android app update – You can finally activate ‘OK Google’ from the Maps screen and get more notifications about new places to check out. Smartphone Owners Move to Block Ads – Mobile Web users have truly embraced ad blocking. At least 419 million people—22 percent of the world’s 1.9 billion smartphone users—prevent ads from displaying on their handsets, a 90 percent year-over-year increase. Approximately 408 million people are using mobile ad-blocking browsers, according to PageFair. They are most popular in emerging markets like China, India, Indonesia, and Pakistan; about 36 percent of those in the Asia-Pacific region block ads. In Europe and North America, there are about 14 million montly active users of ad-blocking browsers. Best home weather station: Which one should be your personal weatherman? – Home weather stations are getting more accurate and sophisticated all the time. Follow our buyer’s guide to ensure you’re not left in the cold or soaking wet. 6 Apple Photos tips you need to know – Apple’s image management and editing application, Photos, is an essential component of any Mac and iPhone owner’s digital life, but some of the things it can do are both hard to find and essential. I’m collecting Photos tips and queries at present, but here are five useful tips you may need. 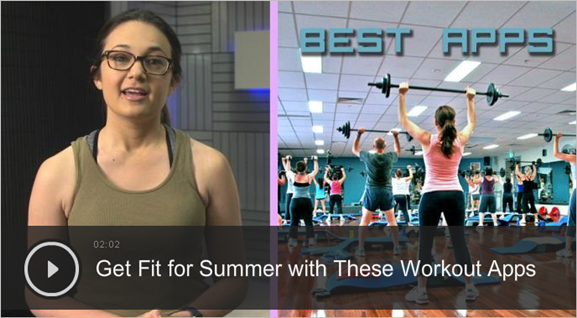 Get fit for summer with these workout apps – Summer is almost here, which means… it’s time to download some workout apps! TechCrunch tested out dozens of the best fitness apps and we narrowed it down to our three favorites. AMD’s next-generation laptop processors are available now – AMD is marking the occasion of Computex Taipei by launching its next-generation laptop processors. The seventh-generation Bristol Ridge A-series APUs — that’s AMD parlance for “Accelerated Processing Units” that include a CPU and GPU on the same chip — feature CPU cores based on the new Excavator architecture alongside Radeon graphics. The FX chips are at the high end of the range, while the A12 and A9 are positioned as competitors to Intel’s Core i5 and i3 processors respectively. AMD is claiming that Excavator delivers up to 52 percent improved CPU performance over the sixth generation, with up to 53 percent higher visual performance than the integrated graphics in unspecified Intel Core i7 processors. 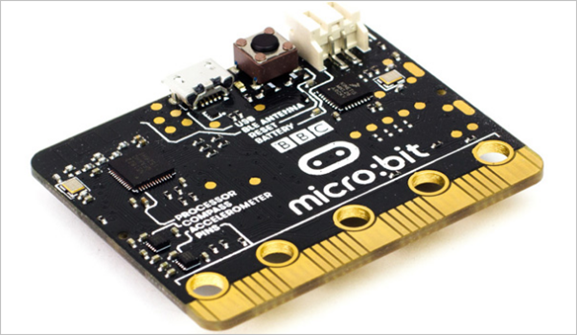 BBC’s $19 Micro:bit computer is now available to give the Raspberry Pi some competition – The BBC partnered with companies like ARM, Samsung, and Microsoft to develop the Micro:bit embedded system. The tiny programmable computers have already been sent out to most year seven students in the UK, and now they’re available for pre-order online with shipping expected in a few weeks. A single Micro:bit costs a mere £13 (about $19), but you’ll have to spend a bit more if you want extras like batteries and a USB cable. Samsung now producing world’s smallest 512GB SSD; it’s half the weight of a dime – Samsung today announced it is mass producing the world’s smallest 512GB PCIe SSD that comes in a single ball grid array package and weighs less than a dime. 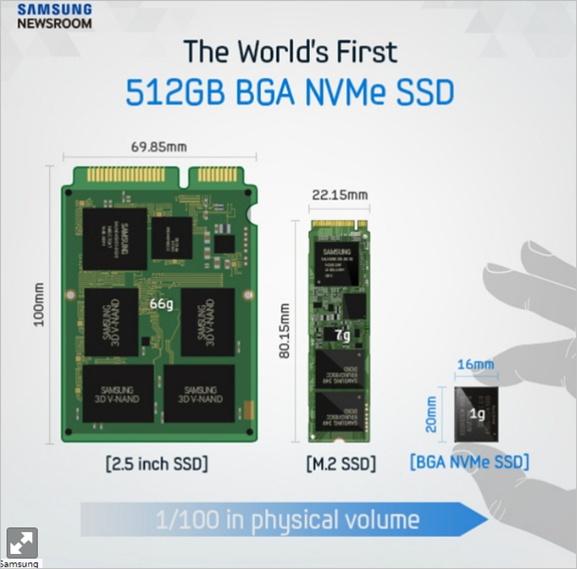 Samsung’s PM971-NVMe SSD is aimed at ultra-thin notebooks and was manufacturing by combining 16 of Samsung’s 48-layer 256-gigabit (Gb) V-NAND flash chips, one 20-nanometer 4Gbit LPDDR4 mobile DRAM chip and a high-performance Samsung controller. Periscope introduces real-time comment moderation – Livestreaming app Periscope is rolling out a new experiment with real-time comment moderation, the company announced today. While its parent company Twitter has struggled over the years with spam and abuse — without much success, let’s be honest — Periscope is aiming to go a different route with the introduction of a community-policed system where users can report and moderate comments as soon as they appear on the screen. Windows 10 will soon let you unlock your PC with wearables – Microsoft is opening up its Windows Hello feature to allow wearables to unlock a Windows 10 PC. The software maker first introduced Windows Hello as a way to support fingerprint readers and even your face to unlock a PC, but its now extending it to devices like the Microsoft Band. During an onstage demo at Computex today, Microsoft showed how the Microsoft Band or devices like Bionym’s Nymi can unlock a Windows 10 PC. Instagram will let you run a business profile if you have a Facebook Page – Soon, business owners will be able to tap into new tools on Instagram, as long as their business has a Facebook Page. 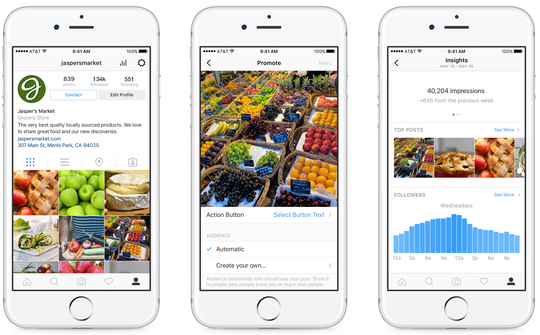 On Tuesday, Instagram introduced a set of new features to allow business owners to better engage with customers using Instagram. These new business tools include official business profiles, analytics, and the ability for business owners to create sponsored posts directly in the Instagram app. Samsung: Don’t install Windows 10. REALLY – Samsung is advising customers against succumbing to Microsoft’s nagging and installing Windows 10. The consumer electronics giant’s support staff have admitted drivers for its PCs still don’t work with Microsoft’s newest operating system and told customers they should simply not make the upgrade. That’s nearly a year after Microsoft released Windows 10 and with a month to go until its successor – Windows 10 Anniversary Update – lands. Samsung’s customers have complained repeatedly during the last 12 months of being either unable to install Microsoft’s operating system on their machines or Windows 10 not working properly with components if they do succeed. However, with the one-year anniversary fast approaching it seems neither of these tech giants have succeeded in solving these persistent problems. Cluster of “megabreaches” compromises a whopping 642 million passwords – Less than two weeks after more than 177 million LinkedIn user passwords surfaced, security researchers have discovered three more breaches involving MySpace, Tumblr, and dating website Fling that all told bring the total number of compromised accounts to more than 642 million. “Any one of these 4 I’m going to talk about on their own would be notable, but to see a cluster of them appear together is quite intriguing,” security researcher Troy Hunt observed on Monday. The cluster involves breaches known to have happened to Fling in 2011, to LinkedIn in 2012, and to Tumblr 2013. It’s still not clear when the MySpace hack took place, but Hunt, operator of the Have I been pwned? breach notification service, said it surely happened sometime after 2007 and before 2012. Why the MySpace hack matters to you, a non-MySpace user – If you’ve ever used MySpace in the past, now is the time to change your current passwords. Don’t bother changing your MySpace password – that ship has essentially sailed (unless you still use MySpace). I mean change every other password you have, especially if you happen to be using the same password now that you used back then, but here and now for a different service. This is more common than you might think. Lots of people do it. Millions of PCs ship with bloatware riddled with security flaws, say researchers – Most major PC makers are shipping their desktops and notebooks with pre-installed software, which researchers say is riddled with security vulnerabilities. A highly-critical report by Duo Security released Tuesday said Acer, Asus, Dell, HP and Lenovo all ship with software that contains at least one vulnerability, which could allow an attacker to run malware at the system-level — in other words, completely compromising an out-of-the-box PC. Microsoft warns of worm ransomware, finds fix in Windows 10 upgrade – Microsoft is warning of a wormable ransomware that infects removable drives on versions of its operating system below Windows 10. The ZCrypt scumware is distributed through old but effective methods of phishing emails, Word document macros, and fake Adobe Flash installers. It drops a warning notice in a HTML file informing victims that their removeable device files are encrypted, and can be decrypted only after payment of $500 in Bitcoins. ZCrypt runs on 64 bit Windows XP relics, and version 7 and 8 boxes that have resisted the Windows 10 upgrade blitzkrieg. Twitter pays out over $322,000 to bug bounty hunters – Twitter has revealed that the firm has paid out $322,420 to bug bounty hunters in only two years. It was not that long ago that researchers seeking to report security vulnerabilities in systems and software had few outlets to do so. Emails and contact forms were the standard communication channel, and should a bug be investigated and deemed valid, the researcher was likely to receive little more than a pat on the back and perhaps public credit. However, things have changed. Cyberthreats and data breaches are now a daily occurrence, which means businesses looking to protect their products and networks have to either hire in-house or seek external help to discover and fix problems before they can be exploited. Microsoft Windows zero-day exploit hits the market with $90,000 price tag – Russian hackers are selling a zero-day vulnerability for $90,000 which allegedly works against many different evolutions of the Microsoft Windows operating system. The exploit is on sale in the Russian underground forum exploit.in. The seller, “BuggiCorp,” claims the zero-day flaw works against all versions of Windows from Windows 2000 to the current Windows 10 OS. Zero-day vulnerabilities are a nightmare for vendor security teams. These exploits are unknown to software developers and until they are discovered in the wild, cyberattackers can compromise systems without detection. As a result, zero-day flaws often reach high prices. Tor switches to DuckDuckGo search results by default – In a note on what it dubs its “search engine situation” the pro-privacy browsing netTor users are currently being served DuckDuckGo search results by default.work confirms it is still using privacy tool Disconnect as its search provider but has asked it to switch to DDG results, owing to an issue with Disconnect’s access to Google’s search results. Salesforce buys Demandware for $2.8B, taking a big step into e-commerce – Salesforce made its name originally with cloud-based software to help salespeople manage their leads and close deals; and today the company took a big step into the business of sales themselves. Today the company announced that it would spend $2.8 billion to acquire Demandware, a cloud-based provider of e-commerce services to businesses big and small, which will spearhead a newer business area: the Salesforce Commerce Cloud. PayPal to halt operations in Turkey after losing license, impacts ‘hundreds of thousands’ – Turkey has been making moves to bring tech business in the country under more localised control, and today big U.S. online payments company PayPal became the latest casualty. The company announced that it is suspending business operations in Turkey effective June 6, after failing to obtain a new license for its services. Dell’s private buyout shortchanged shareholders, court rules – Michael Dell and Silver Lake Partners paid about 22 percent too little for Dell when they took the company private in 2013 and will have to pay millions of dollars more to shareholders who opposed the deal, a Delaware court ruled on Tuesday. Though the buyers paid $24.9 billion, or $13.75 per share, the company’s actual fair value at the time was $17.62 per share, according to Delaware Vice Chancellor Travis Laster. The decision comes in response to a lawsuit brought by a number of Dell investors who felt shortchanged by the deal. Through what’s known as an appraisal suit, they asked the Chancery Court to determine the fair value of their shares at the time. SoftBank to sell $7.9b stake in Alibaba – Japanese telco giant SoftBank plans to sell around $7.9 billion worth of shares of Chinese ecommerce giant Alibaba to pay debts, but the two stressed that they will continue their partnership. Xiaomi inks Microsoft patent deal and agrees to pre-install Office apps on its phones – Xiaomi is moving closer to launching its smartphones in the U.S. market. Today the Chinese company announced a partnership with Microsoft that includes a cross-license and patent transfer agreement and the pre-installation of Skype and Microsoft Office products on Xiaomi devices. The companies said that, starting this September, Xiaomi’s Mi 5, Mi Max and Mi 4s, as well as cheaper Redmi Note 3 and Redmi 3 smartphones will be sold with Microsoft Word, Excel, PowerPoint, Outlook and Skype applications pre-loaded. Xbox One price drops to $299 ahead of ‘slim’ console rumor for E3 – Microsoft is discounting its Xbox One to $299 ahead of new hardware expected next month at E3. The software giant unveiled the promotion over the weekend, and every Xbox One bundle is now reduced by $50 until June 13th. Microsoft’s timing is well suited to its E3 press conference, which starts on June 13th. Rumors suggest Microsoft will launch a new “slim” Xbox One at E3 next month. The updated Xbox One console is expected to be 40 percent smaller than the current model. PlayStation Plus free games of June 2016 for PS4, PS3, PS Vita – The PlayStation 4 games include NBA 2K16 and Gone Home, while PlayStation 3 owners can pick up Echochrome and Siren: Blood Curse (Episodes 1-12). Freebies for PlayStation Vita in June include Little Deviants and God of War: Chains of Olympus. These games will be available when the PlayStation Store refreshes next week. The 10 most streamed video games this week – We’re back once again with the top 10 most streamed games and most viewed channels across streaming services. The highly anticipated Overwatch was released last week and it has made its presence felt on both the most streamed games and channels lists. Besides that title, we see a lot of the same games and channels from weeks past, though there are a few notable titles which have dropped off the lists entirely. As always, these numbers come to us from the stream monitoring service, Gamoloco. These charts are based on the nearly million people and more than 26,000 channels on streaming services worldwide. Overwatch and the new wave of friendly online shooters – There’s a new multiplayer-only shooter out, and I’m really having a lot of fun with it. Just a few years ago that’s not something you would have heard me say. The genre has historically not been very welcoming to newcomers; the result of entrenched players who are simply way better than you are, and often toxic communities that aren’t very pleasant to be around. No one enjoys repeatedly dying while someone laughs at you the whole time, slowly building up enough experience for a half-decent scope or zoom option. 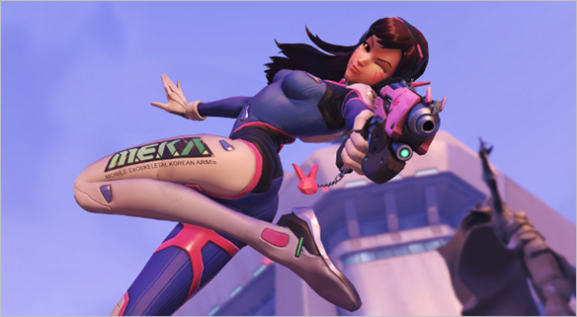 But thanks to games like the recently launched Overwatch, that mentality is changing. How not to get Likes on Facebook – Another small business faces the ire of the internet – City Park Apartments in Salt Lake City, Utah finds itself crushed under a flood of vindictive online retribution for demanding its tenants “friend” the company’s unofficial Facebook page within five days. Clearly, the landlord was unfamiliar with the more recent term, “Like,” and chose the antiquated “friend” instead. But wait, it gets worse. Anyone who does not comply could be found in breach of contract, according to a letter found on tenants’ doors last week. 27 old-school computer error screens that will fill you with anxiety – For as long as there have been computers, there have been computer crashes — terrible, inconvenient, work-deleting crashes. But in this gallery, we celebrate the computer error — Blue Screen of Death and inexplicable warning window alike … if you can suppress your anxiety long enough to click through it, that is. Whirlpool Vessi puts a microbrewery in your kitchen – If you were waiting for proof that home brewing appliances weren’t just a passing fad, here it is: Whirlpool, one of the world’s largest appliance makers, is going to make one. They call it Vessi, and this is no dainty countertop Keurig for beer. 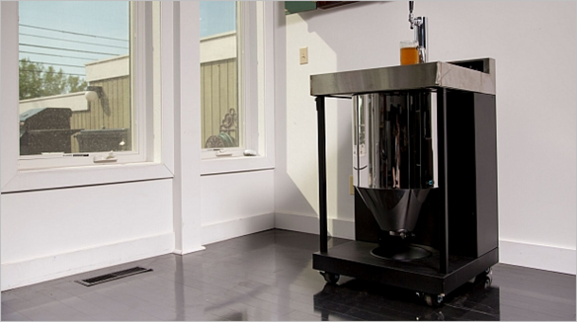 Vessi is serious brewing gear for the serious home brewer. It’s a fermenter just like the ones you’d see on a brewery tour, shrunken down for home use and stuffed into a standard 24-inch kitchen appliance. Rip out your dishwasher, beer lovers, because there’s a much more useful piece of hardware you can install in that spot now. Nearly 1 in 4 people abandon mobile apps after only one use – Apple’s iTunes App Store is home to over 1.5 million apps and Google Play hosts over 2 million, but the number of apps that actually get installed and used on consumers’ devices is still quite small. We already knew that people only interacted with a small handful of third-party apps on a regular basis, and now, according to a new study on mobile app usage, we learn that about one in four mobile users only use an app once. Based on data from analytics firm Localytics, and its user base of 37,000 applications, user retention has seen a slight increase year-over-year from 34 percent in 2015 to 38 percent in 2016. However, just because this figure has recovered a bit, that doesn’t mean the numbers are good. Instead, what this indicates is that 62 percent of users will use an app less than 11 times. $13 million in confiscated bitcoins to be auctioned by Australian police – If you want to get in on the Bitcoin action (and have the bank to back you up), now’s a good opportunity. The Australian police will be auctioning 24,518 bitcoins seized as the proceeds of a crime. The exchange rate at the time of writing sees one bitcoin equal $534.18 — so that’s over $13 million worth of the digital cryptocurrency. It will be second time that such an auction has taken place, following the auction of over 144,000 bitcoins by the US Marshals Service last year. Microsoft Research “FlashBack” can bring VR even to low-end devices – Virtual reality is truly an incredible technology that deserves to be in everyone’s hands, or eyes rather. But currently, the devices that allow people to experience VR stand at opposite ends of a spectrum, neither of which make VR really accessible. On the one hand, you have dedicated machines like the HTC Vive and Oculus Rift. On the other extreme, you have empty shells that require a smartphone, like the Google Cardboard and Samsung Gear VR. Interestingly enough, the middle ground between these two might have just been discovered thanks to the efforts of Microsoft Research. Called FlashBack, it is a combination of technologies that could let even less powerful smartphones and laptops handle the load required for a smooth, jitter-free, nausea-free VR experience. 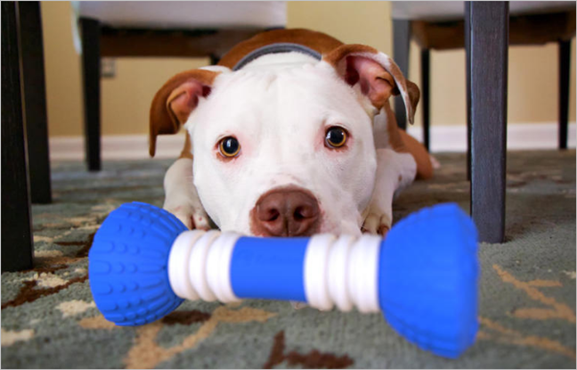 GoBone: The smart pet toy that plays with your dog when you’re not around – Pet tech is one of the emerging trends in the gadget world. The “smart bone” is a toy that rolls, spins and flips, keeping your engaged and entertained for up to eight hours. When you’re home, you can use the smartphone companion app for more targeted games like fetch and hide-and-seek. Smartly, the exterior of the GoBone is replaceable, so you can swap in a fresh skin once the old one gets chewed up. And, of course, the GoBone’s battery is rechargeable. Belarc Advisor – Free Personal PC Audit (Version 8.5c) – The Belarc Advisor builds a detailed profile of your installed software and hardware, network inventory, missing Microsoft hotfixes, anti-virus status, security benchmarks, and displays the results in your Web browser. All of your PC profile information is kept private on your PC and is not sent to any web server. Operating Systems: Runs on Windows 10, 8.1, 2012 R2, 8, 2012, 7, 2008 R2, Vista, 2008, 2003 SP2, XP SP3. Both 32-bit and 64-bit Windows are supported. Our professional products also run on all other versions of Windows and on the Macintosh OS X, Linux, and Solaris operating systems. Browsers: Runs on Internet Explorer, Google Chrome, Microsoft Edge, Firefox, Safari, Opera, and many others. License: The license associated with this product allows for free personal use only. Use on multiple PCs in a corporate, educational, military or government installation is prohibited. See the license agreement for details. Cops can easily get months of location data, appeals court rules – A full panel of judges at the Fourth US Circuit Court of Appeals has now overturned last summer’s notable decision by the standard trio of appellate judges, which had found that police needed a warrant to obtain more than 200 days’ worth of cell-site location information (CSLI) for two criminal suspects. In the Tuesday en banc decision, the Fourth Circuit relied heavily upon the third-party doctrine, the 1970s-era Supreme Court case holding that there is no privacy interest in data voluntarily given up to a third party like a cell phone provider. That case, known as Smith v. Maryland, is what has provided the legal underpinning for lots of surveillance programs, ranging from local police all the way up to the National Security Agency. All your disk image are belong to us, says appeals court – The government can prosecute and imprison people for crimes based on evidence obtained from their computers—even evidence retained for years that was outside the scope of an original probable-cause search warrant, a US federal appeals court has said in a 100-page opinion paired with a blistering dissent. The 2nd US Circuit Court of Appeals ruled that there was no constitutional violation because the authorities acted in good faith when they initially obtained a search warrant, held on to the files for years, and built a case unrelated to the original search. The case posed a vexing question—how long may the authorities keep somebody’s computer files that were obtained during a search but were not germane to that search? The convicted accountant said that only the computer files pertaining to his client—who was being investigated as part of an Army overbilling scandal—should have been retained by the government during a 2003 search. All of his personal files, which eventually led to his own tax-evasion conviction, should have been purged, he argued. But the appeals court said the authorities’ behavior was acceptable and didn’t reach the constitutional question of whether the Fourth Amendment rights were breached for accountant Stavros Ganias, who was sentenced to two years in prison. That’s because three years after the original search of the accountant’s files in connection to the Army scandal, Connecticut authorities got another search warrant for Ganias’ own tax files that were already in the government’s possession, the appeals court ruled in a 12-1 decision Friday written by Judges Debra Ann Livingston and Gerard Lynch. Ganias had subsequently deleted those files from his hard drives after the government had imaged them, according to court records. Rick – you are the BEST!! So glad to hear from you Paul. I sort of feel remade in a sense, now that I’m back pounding the Tech highway. I’m so pleased you’re well, my friend. Unfortunately I haven’t been around much myself; been very remiss in keeping in touch with people, (new job and all it entails). It’s good to read your blog again, and may you continue writing for many years to come. I can’t remember when I started visiting but I know it can be counted in years. Not many bloggers can hold my attention for that long. Thanks Paul- your comment is most appreciated.